Successfully Added Foldable HiFi Speaker Dock Stand for iPad, iPhone, iPod to your Shopping Cart. Elevate your media-listening experience to new heights with this Foldable HiFi Speaker Dock Stand. Just connect your iPad, iPad2, iPhone, iPod, or iPod Touch for a more crisp and detailed sound that will satisfy even the most discerning listeners. Hear music as it was meant to be heard with this Foldable HiFi Speaker Dock Stand. Engineered to produce pure sound for an amazing audio experience, all the highs, mids, and lows are rendered in great detail and come to life with unparalleled richnes. 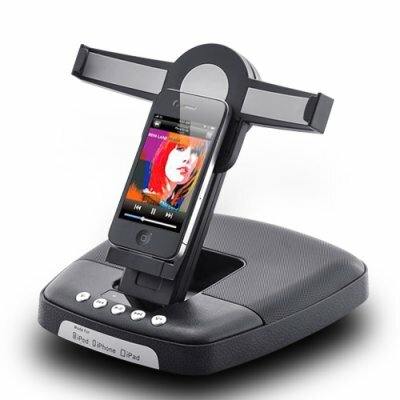 This Foldable HiFi Speaker Dock Stand is compatible with your iPad, iPhone, iPod; just dock it in and you're set up. The Dock Stand can be rotated 90 degrees counterclockwise, allowing you to easily change between landscape (great for watching movies) and portrait (great for pictures and regular use) orientation. The angle can also be adjusted for optimized viewing position. Finally, a 3.5mm headphone connection port is available so you can listen to the beautiful sound without disturbing others. Available in our warehouse now, order today and we'll ship this Foldable HiFi Speaker Dock Stand out tomorrow. Brought to you by Chinavasion, the leader in wholesale electronics and Apple accessories.